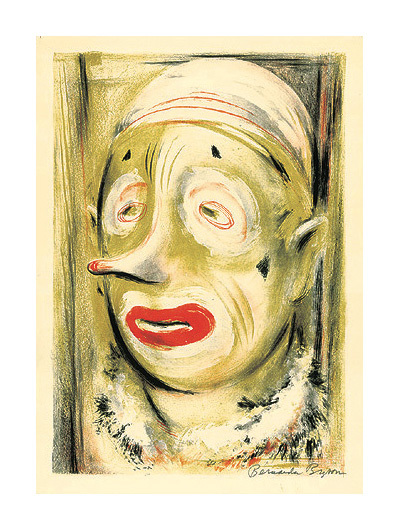 Untitled (Clown) ---c.1937, Color Lithograph. Image size 14 1/16 x 9 3/4 inches (358 x 248 mm); sheet size 19 x 12 1/2 inches (483 x 318 mm). A fine, fresh impression, on cream wove paper, with full margins (1 3/16 to 2 3/4 inches), in excellent condition. Exhibited:The Visual Literature of Bernada Bryson-Shahn, James A. Michener Art Museum, Doylestown PA., Jan. 29 - Apr. 24, 2005.